The Ramayana of the sage Valmiki is a literary masterpiece in the Sanskrit language, which excels in beauty, style and diction. It is believed that the twenty-four letters of the Gayatri Mantra are hidden in the Ramayana. The beginning letter of every thousand words starts with one word of the Gayatri. The Gayatri starts with the word, "Tat" and the Ramayana also starts with the same word. Each word of the Gayatri is found in a consecutive sequence at the beginning of every thousand verses of the Ramayana. The Holy Ramayana is believed to be the Veda itself "Vedah prachethiasath aseed sakshath Ramayanatmana". Valmiki wrote the Veda itself in this mighty epic. Spiritual seekers read it as a protective cover for all the problems of life, and it acts as a shield. It is a well known practice amongst spiritual seekers to make a regular practice of reading the "Sundara Kanda" to imbibe into themselves the strength and prowess of Hanuman. No one can really plumb the depths of the meaning of Valmiki's Ramayana. Usually the reading of the Mahabharata is done in the morning, of the Ramayana in the afternoon and the Sreemad Bhagavatam in the evening. The Sanskrit verse which describes this is as follows: "Good people engage themselves in dice play in the morning (meaning the Mahabharata), at noon they engage themselves in talks about women(meaning Sita in the Ramayana), and at night, in theft (meaning the Sreemad Bhagavatam)". There are many controversies in the Ramayana such as the absence of Bharata during the coronation of Sri Rama, Rama's attacking Vali from behind a tree and finding fault with him with charges which do not seem feasible. Valmiki has produced in Rama, an aspect of human nature which is impossible to understand. He brings together in the same person the might of God and the frailty of man. This kind of presentation of the ideal man is either totally ignored by devotees or subjected to critical examination. Either way, the Ramayana is a great exercise in disciplining the mind in its attempt to bring God and man together in a single individual. Valmiki ofternrefers to Rama as narayana Himself. It is said that in this last moments, Ravana saw Rama as the mighty Vishnu or the God of the universe. The Ramayana should be studied diligently by everyone, for the dignity of the language in which it is w5ritten as well as the depth of the message it conveys, It presents before the reader the inscrutable manner in which God works and the fickle nature of all human decisions, Valmiki brings God to earth and raises the earth to Heaven, Since this type of blending is inconceivable to the human way of perception, there are endless interpretations of the Ramayana, presented by pundits, story-tellers and scholars. It is certain that an intensive study of Valmiki's Ramayana will fill the mind of everyone with inordinate strength and incalculable blessedness. Valmiki says that the glory of the Ramayana will remain as long as the sun and the moon last. The astounding descriptions of the rule of Rama and his administrative capacity reflect the very conditions of a life in Heaven. Great is the Ramayan. Glory to the way of administration of Rama in every field of life in this world. Mata Devi Vanamali has done a novel service to the religious community in expounding the involved meanings of the Ramayana text and making it attractive to the modern mind with beautiful English expressions. 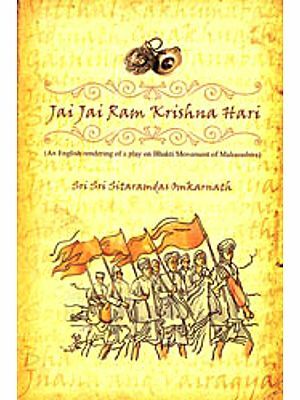 This book is a companion volume to her book on Lord Krishna called, Sri Krishna Lila. Sri Ramachandra Bhagvan ki Jai!